All Workshops and Paddles will be full day events unless otherwise indicated. Approximate timings are 09:00 to 17.00. All participants should meet at Cromarty Brewery and Arts Centre for all sessions unless a pre-arranged meeting place has been confirmed. Below is a list of the anticipated workshops planned for both days of the Symposium weekend. However, the symposium organisers retain the right to make changes according to both operational and unforeseen circumstances. All participants will be able to register an interest re particular workshops prior to the weekend and upon arrival at registration. The day trips will be chosen on the day according to the weather and will be focussed on enjoying a day out on the water seeing the sights and spending time on the water with new people, local trips to Cromarty Sutors, Fort George and Rosemarkie. These trips will be guided by a coach and there is no experience of journeys required. Plan a day trip taking into account weather, tides, distances with the assistance of your coach and then go paddle it according to your plans. For those from the novice who have done a little bit of sea kayaking to folk who have done a bit of sea kayaking but want some more focused input into techniques and strokes. The exact content will be led by those participating. We will provide two days of coaching up to 4 star level as far as conditions allow. Please note that whilst the skills coaching will follow the the BCU/SCA requirements, this is not a BCU/SCA syllabus course. 4 star skills will be developed where weather and conditions allow but unfortunately we are not in a position to guarantee suitable conditions. We may therefore have to offer alternative options and cannot offer any refunds should conditions be unsuitable. We are running this practical course in planning and and navigating effectively on coastal journeys. This will be a kayak based course (not land based), looking at interpreting maps, tide tables and weather shipping forecasts for the Cromarty area whilst we have a day out on the water. This workshop will focus on honing those skills required for 4 star level, but without the leadership element, taking you on that the next step of your journey. The exact content will depend on the conditions over the weekend but may include rough-water confidence, rolling, surfing and other skills you may wish to work on. The exact content will be led by those participating. Safe paddling in rock gardens, surfing in rocky environments, specific techniques for close quarter paddling – this session will introduce and develop essential rock hopping skills. Develop your close quarter sea kayaking skills in more challenging conditions. Develop surfing skills in rocky environments. The day will look at rescue and responding to incidents which may develop within a group on the water. This could cover prevention, rescues, towing and casualty management (assuming a basic knowledge of first aid), repairs and other forms of improvisation on the water. We were lucky to team up with both the Coastguard Helicopter from nearby Dalcross and the RNLI Inshore Lifeboat from North Kessock in previous years. We hope to repeat the same joint exercise again this year but this is very dependent on the availability and commitments of the crews of the two organisations. It is advisory to be of a minimum BCU 3* standard or have equivalent experience. By popular demand, we are running a day of Inuit skills led by Rowland Woollven. A fleet of double sea kayaks will be available to try out and experience this great way of paddling. New to sea kayaking? 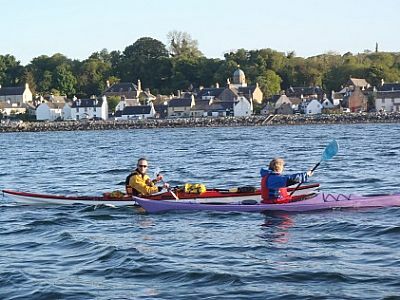 Come and try a sea kayak with an experienced coach in the safety of Cromarty Bay. A focus upon the broad spectrum of physical and adaptive equipment to be used when coaching young people and adults with additional support needs. To be undertaken in small groups, practical workshop including different craft. If you require any further information, please contact Simon or go the Cromarty Brewery and Arts Centre. Sunday evening pack up and farewells…… We hope to see you again next year for the 2020 Black Isle Sea Kayaking Symposium! Cromarty Village offers a wide range of accommodation and eating places, and we will be offering bed and breakfast in The Old Brewery which will also be the base for our symposium.